Perfectly upholstered for an up-scale look of sophisticated charm, this living room and den room chair features a high-end style of upholstered class. Designed to blend modern with traditional styes, this transitional piece features an eye-catching frame with flowing curves that combine with smooth pulled upholstery. Exposed wood legs and welt cord trim complete the piece with a fine tailored accent. Pair this chair with its coordinating ottoman for a two piece set in your living room, bedroom, parlor or den. 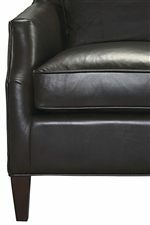 The Kent Transitional Den Room Accent Chair by Bassett at AHFA in the area. Product availability may vary. Contact us for the most current availability on this product. The Kent collection is a great option if you are looking for Transitional furniture in the area.